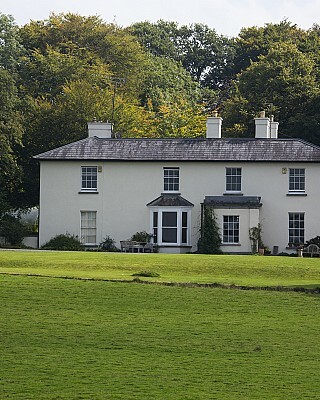 The house and estate has been in the same family since it was built in 1820 by George Battesby, the current occupier, Verity’s, Great Great Great Grandfather. The house is being lovingly restored by Verity, having returned from England to live in the family home. 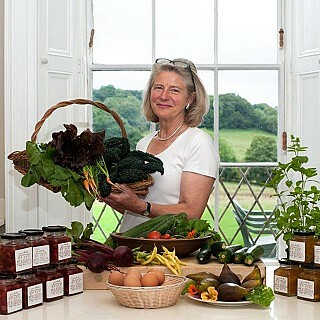 Verity ran her own catering and events company in Gloucestershire for over 20 years. Her passion for cooking & entertaining shines through. Guests enjoy an extensive and varied breakfast with much of the ingredients being grown or reared by Verity herself, and delicious dinners are on offer. Breakfast is eaten in the large newly restored dining room, with wonderful views over the lough and of the parading peacocks on the rolling lawns. Both of the large, en-suite rooms have fine views down the length of Lough Bane and over the wooded hills while the single room and the twin/double room have sweeping views of the surrounding parklands. Guests are warmly welcomed and encouraged to relax in the homely drawing room in front of a roaring fire or to explore one of the many local historical sites, gardens, walks or cultural entertainments on offer. Several areas of the estate have been classified as Special Areas of Conservation (SAC‘s) due to the incredibly varied and rare flora. Wild flowers can be found in abundance and a charming fern walk has been the created amongst the woodland near the house. Discounts available for three nights or more. Children & pets welcome.